Sometimes you just want some nasty old fried chicken fingers, but as a rule they are flour-coated transfat-laden monstrosities. How to enjoy the crunch without all the badness? Almond flour! Heat the oil a large pan over medium-high heat (but closer to medium than to high - you don't want the almond flour to burn). Cook the chicken in two batches until it is golden on each side. I've only ever made this fresh for dinner so I don't know if it would keep well for lunches or not. I suspect it might get a little gummy. Crushed pork rinds also make a decent bread crumb substitute but they get soggy very quickly after cooking so you must eat them immediately. Also, some people are kind of squicked by pork rinds. happy shiny bonus date mustard recipe! 1/2 cup dates with pits removed, 2/3 cup extra virgin olive oil, 1/4 cup apple cider vinegar, 1/2 cup water, 1 tsp salt, and 2 T prepared mustard; put all the ingredients in a blender and let it rip until it's smooth; pour into a small saucepan and simmer gently for 10 minutes; serve warm or cold. I got this fantastic condiment from a cookbook called The Philosopher's Kitchen. almond flour- of course! why didn't i think of it before? thanks for sharing- this sounds (and looks) delicious! Date mustard! What do you put it in? The date mustard is really good for dipping chicken in. It especially helps out dry chicken breast since it's mostly olive oil (yay fat). I've also dipped veggies in it though and it's just as good that way! I haven't tried it with any other meats, but I imagine it would go very well with salmon. The original book I got it from had it as a sauce for grilled chicken that had been marinated in white wine vinegar, olive oil, and celery seed. It might even make a good salad dressing if you thinned it out a little. I tried these - they were awesome. Thanks for the great recipe. Tried these tonight and the spices are perfect. 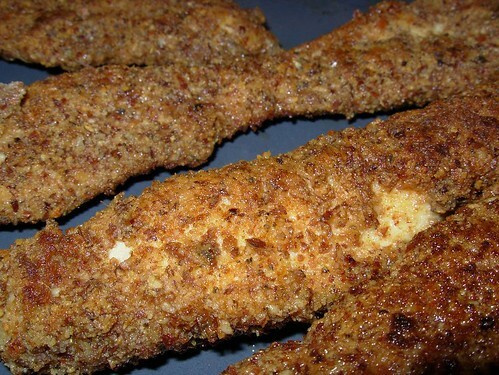 Really good chicken fingers. Tried these tonight. I loved them! Even my partner said they were great! :) definitely recommend people try them out. Found this a few days ago, and gave it a try. Friggin delicious. My anti healthy eating family tried snatching some bites, and being nice I let em, and it was wide eyed wonder for two hours straight. Will be making these OFTEN ! Delish. Thanks for recipe!